The details of each variation are described later. Let us first look at the overall results. The table shows the net present value of expected loss as a percentage of the initial balance. To give deeper insight, the graphs show the projected annual CECL over 6 years for each of the variations. 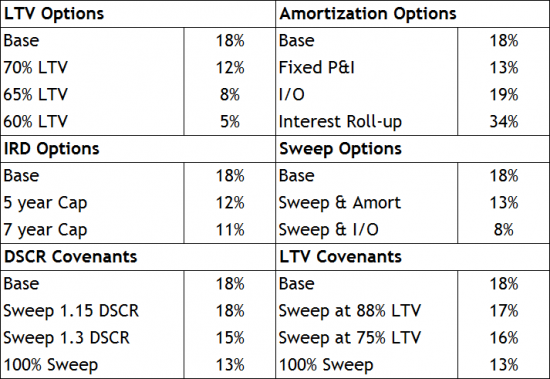 The annual loss profiles show the balance between market risk, lease risk, and refinancing risk. 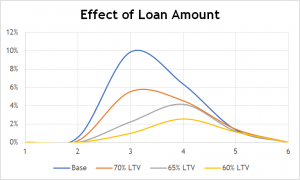 As one would expect, reducing the loan amount reduces the risk significantly, and it is interesting to note that, for this deal, as the loan amount reduces, the risk shifts towards the later years. For this deal, Fixed P&I produces the lowest risk. At the other extreme, the effect of interest roll-up is to eliminate payment defaults during the life of the loan, but at the cost of a large spike in refinancing risk. The two variations for interest rate caps are a cap until loan-maturity and a cap extending two years past maturity. 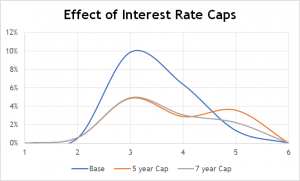 Given the "moderately negative" forecast scenario, with increasing rates, the caps significantly reduce the payment-risk during the life of the loan and the extended cap also reduces the refinancing-risk. 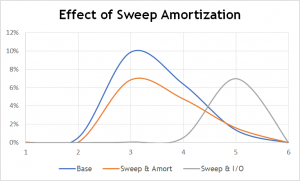 The sweep amortization structures use any excess income to pay-down the loan. The base-case is a traditional mortgage with no sweep. 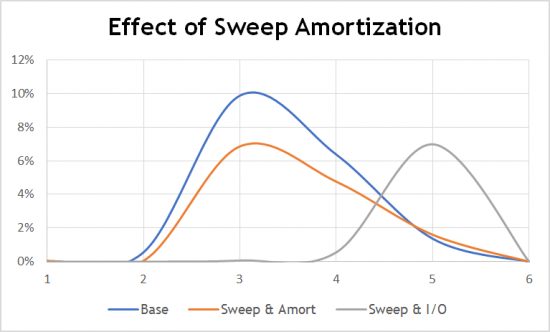 Adding a sweep to the traditional mortgage reduces the peak risk somewhat, but there are still many occasions where the loan defaults because there is not sufficient income to pay the required amortization. The third structure requires payment of interest only, plus a sweep of any remaining cash. 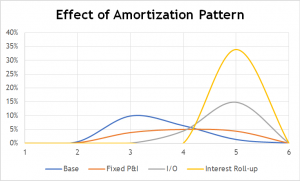 This structure greatly reduces the probability of early payment default, with little extra refinancing risk. 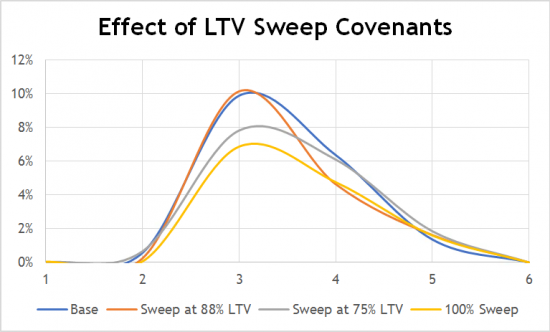 If such a sweep is acceptable to the borrower, it can be priced with the same risk-cost as the 65% LTV deal. 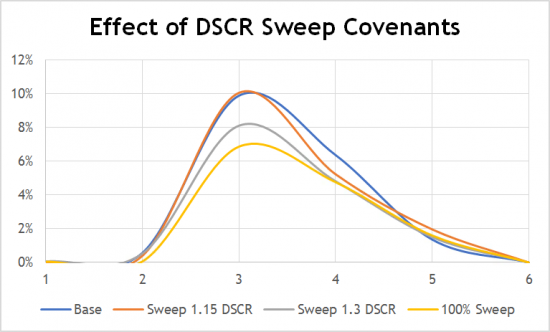 The last two sets of results show the effect of having covenants to require sweep payments only if the LTV or DSCR hit certain thresholds. 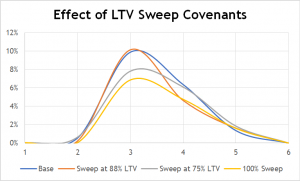 In both cases, the covenants are only modestly effective because in those scenarios where the deal has deteriorated enough to trigger the sweep, there is little spare cashflow available. Beyond the details of the property, the details of the financing structure give lenders many opportunities for tailoring the risk profile. 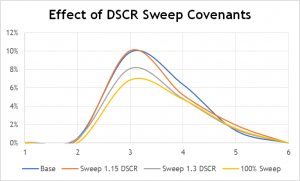 The extent of the effect is different for each underlying property and can be quantified with the same tools used for CECL. 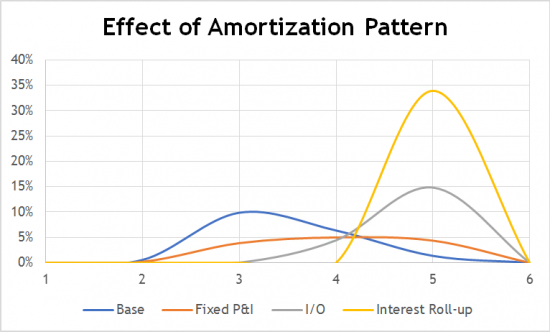 With capital and accounting both depending on the measurement of risk, this analysis shows that there are plenty of opportunities for arbitrage and mispricing.